And there was other exciting news..
'This has got your name all over it', said the husband, laying a small parcel on my lap last night. 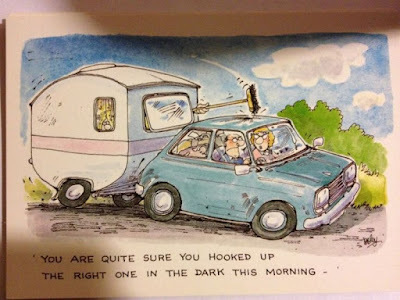 Wondering what on earth I'd forgotten I'd bought, I opened the box, only to find that it was the welcome pack from the Caravan Club. I'd joined on the advice of every person who has ever owned a caravan or motorhome - it's the law apparently, and it means that pitches will be cheaper, shower blocks well tested and most importantly of all, it tells you which sites have banned children. Not that I dislike children, but the Wobble Box is a means to get away from ours, so it seems questionable to choose to be surrounded by everyone else's. And so it was that the husband came back into the lounge an hour later to find me stretched out on the floor, with a map of the UK spread out on the rug, looking at places we could consider staying now we have Charlie, The Wobble Box. 'We do have sat-nav you know', he said with a sigh, doing a complete 360 degree turn and walking out again. But the most exciting bit of the parcel was a sticker. Two actually. One for your car, and one for your Wobble Box. Waving them in the air at his retreating back, I said, 'We have to stick these on the caravan somewhere'. 'I don't care where you put it, as long as I can't see the bloody things', he muttered. I do hope he's not having second thoughts about this, as I'll have to learn how to tow it otherwise. Or was it the bedroom curtain?